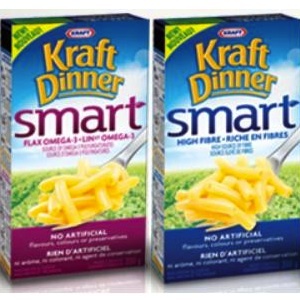 On Checkout 51’s list this week (Sept 19-25, 2013) is Kraft Dinner Smart, buy 2, 150 or 200g variety. Items must appear on the same receipt. The classic cheesy KD taste kids love with added ingredients blended right into the noodles. We use real Kraft cheddar, and there are no artificial flavours, colours or preservatives. Best of all, every 50 g bowl (¾ cup prepared) contains a ½ serving of veggies (cauliflower), is a high source of fibre or a source of Omega-3 polyunsaturates – all without changing the taste. Picky eaters will never know the difference! You will get $1.00 cashback rebate at Checkout 51. Here’s a pic of what it looks like. I found a couple prices of it at a few stores.